Leverkusen - While Bayer 04 Leverkusen coach Roger Schmidt handed playmaker Hakan Calhanoglu a well-deserved rest, Gonzalo Castro seized his opportunity in attacking midfield with both hands: scoring twice and laying on a further two goals in die Werkself's 4-0 hammering of Hamburger SV on Matchday 27.
bundesliga.com: Gonzalo Castro, congratulations on a fantastic display in the 4-0 home win over Hamburg. How would you sum up the game? Gonzalo Castro: We played well. We took advantage of Hamburg's weaknesses clinically and they did us a favour by trying to play it out from the back. We were looking for that and it was all the better for us. Castro: We've become more mature. We know what we want. We had two great chances straight after the break and we could even have scored a third earlier than we did. At the end, the 4-0 scoreline was more than deserved. bundesliga.com: And did you enjoy playing in attacking midfield? Castro: Yes, of course. When you score twice and set up two more, it's always enjoyable. Now and then, it's suits me to play there, but in all honesty, I'm the holding midfielder and Hakan Calhanoglu is the attacking midfielder. I'm just as pleased that Stefan Kießling scored twice. Those goals were hugely important for his state of mind. bundesliga.com: It's now five wins and five clean sheets in a row for Leverkusen. After a slow start to the Rückrunde, would you say you're now the Bundesliga's form side? Castro: We're pleased with ourselves. The criticism was justified and somehow the have worked out well. After those games, we stabilised and really improved our defensive work off the ball. We're becoming more solid every week and we've now got another good full back with the return of Tin Jedvaj. That will improve the whole team. bundesliga.com: On Wednesday, you welcome Bayern in the Cup. They'll be without several key players, including David Alaba, Arjen Robben and probably Franck Ribery. How confident are you that you can beat the holders and reigning Bundesliga champions? Castro: We want to qualify for the next round. Obviously we know it'll be tough and we'll have to do everything we can to make it as difficult as possible for Bayern. But we know what we're capable of and will approach the game with confidence. Our counter-attacking style is incredibly fast and impressive. After winning 4-0 against HSV and recording five straight wins, confidence is high amongst the team. We know, though, that Bayern can also dominate a game and keep your backs to the wall. We're really looking forward to the challenge. Castro: That's a good omen, but it'll be a difficult game, even if they have a few players out injured. Bayern always have equally talented players in reserve, anyway. bundesliga.com: It seems that Roger Schmidt has made the players better. How has he done that? Castro: He is a good coach, who has a system. It's a system which is completely different to that of other teams. I like the way of playing, as does, for example, Karim Bellarabi. For all of us, it's great to be playing in this system: it's demanding, but we're having success with it. bundesliga.com: Are we currently seeing the best Gonzalo Castro in a long time? Castro: I'm playing well, but that's due to the team. When the team plays well, every individual player also does likewise. Julian Brandt played excellently against HSV, as did Kießling, and the four at the back are defending outstandingly. 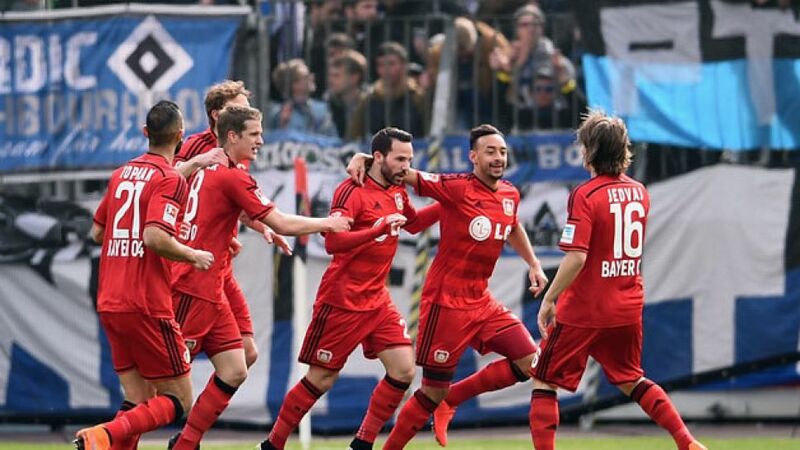 bundesliga.com: Leverkusen are currently fourth and eight points clear of direct rivals FC Schalke 04. Are you now looking upwards at overhauling Borussia Mönchengladbach? Castro: Of course: we want to finish the season in third. Gladbach have got some tricky games coming up, but so do we. We will have to fight hard in the remaining seven matches. If we win a lot of them, then we'll see at the end of the season where we end up. Gonzalo Castro was speaking to Tobias Gonscherowski.